A solar dude’s thoughts on the value of a cleaner energy future and Proposition 127. 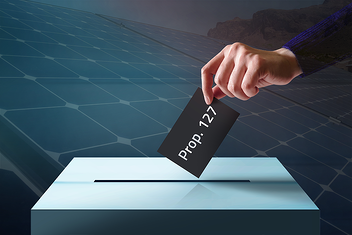 Proposition 127 is on the ballot for November and like so many other recent moves in Arizona’s evolving energy landscape, the embedded players are funneling millions of dollars into scary advertising campaigns to ensure the status quo when it comes to how Arizonans power their lives. The scariest of these ads attempt to show how voting “Yes” will cause Arizona electricity rates to skyrocket. This is a fairly weak argument considering all three of Arizona’s largest utilities have raised rates in the last couple of years and/or have further rate increases on their dockets. So, let’s shine some light on the facts and see if we can separate reality from the scare tactics for this important choice. 1. Scare Tactic: If Proposition 127 passes, energy prices will skyrocket. The anti-127 ads claim that customers will experience increases as high as $1,000 per year. Is this a scare tactic? Precedent would point to yes. For the sake of comparing apples-to-apples, let’s look at those states that are most similar to Arizona. If you look at the Energy Information Administration’s (EIA) data comparing other “Mountain States” (Colorado, New Mexico, Montana) that have made greater progress toward their renewable energy goals, the vast majority of these mountain states are on par, and in some cases cheaper, than Arizona. In short, the precedent does not support the rate increase suggested by the anti-127 ad campaign. 2. Fact: We are running out of time. We already have a renewable mandate of 15% by 2025. Proposition 127 is simply asking Arizonans to join communities around the globe who are taking more aggressive action on the urgent issue of climate change. On October 7th, a landmark report from the UN’s Intergovernmental Panel on Climate Change describes a dramatic increase in food shortages, flooding, wildfires, and mass die-offs of key ecosystems by 2040 if something dramatic isn’t done NOW. You only need to look at increasingly violent storms, rising seas, and the dramatic shifts in our own desert weather patterns to extrapolate an uncertain future. Voting against Proposition 127 reinforces a fossil fuel status quo with more CO2 emissions locked in for decades. What kind of world will you leave your children and grandchildren? 3. Scare Tactic & Fact: If Proposition 127 passes, the grid will need an upgrade. I have news for you: the grid is going to get an upgrade whether Proposition 127 passes or not. Power utilities are probably not going to fund these upgrades out of a sense of giving either—it will come from the ratepayers. In 2017, more people moved to Maricopa County than any other county in the country. In preparation, APS has already published a desired 15-year expansion plan called the 2017 Integrated Resource Plan, which relies heavily on natural gas expansion. Many decades of precedent shows that power utilities will continue to raise rates whether or not future expansions prioritize natural gas or renewable energy. The question then becomes what do you want your dollars to pay for? Natural gas, which produces carbon emissions that contribute to climate change? Or would you rather invest in a cleaner energy future for your children and grandchildren? 4. Fact: Solar is cheaper and safer than natural gas. As innovation and technology advances make solar cheaper, it’s hard to argue for investing in a natural gas energy infrastructure on price alone. Utility-scale solar has dropped by 30% between 2010 and 2017, edging out other forms of new energy generation. This levelized cost of energy report shows how cheap solar energy is compared to other forms of energy, including natural gas. Equally as important is the environmental costs. Collecting natural gas requires fracking, which has been proven to contaminate groundwater and add to continental plate instability. To top it all off, natural gas still produces carbon emissions. When solar is a cleaner, safer, and cheaper energy alternative, natural gas just doesn’t seem like a wise investment. 5. Fact: Solar creates jobs. The idea that if Proposition 127 passed, Arizona would end up losing jobs doesn’t hold any water either. The solar industry workforce has seen rapid growth – increasing by 168% since 2010 – and it continues to outshine job growth in other energy sectors. Adding more solar to Arizona’s energy portfolio would add some of that rapid job growth within our state. 6. Fact: Your ACC vote matters. When all is said and done, the utilities don't make the final decision on rates, the Arizona Corporation Commission (ACC) does. Even if you’re still uncertain about Proposition 127, your vote for the next round of ACC commissioners is just as important, if not more so. Read up on what each ACC candidate supports and vote for the one you believe aligns with your vision for Arizona’s energy future. We encourage you to vote however you feel on Proposition 127, but please do future generations a favor and thoroughly research the issue beyond just the ads alone. Don't forget to research the ACC candidates as well. The Sierra Club offers a good resource if you're looking for a starting point for your research. The type of world you leave to your children and grandchildren begins with these important decisions.